Digital Mix offers full HD, frame by frame scanning of small gauge film formats. We can scan the following film formats. Our full high definition film scanning system captures film using the frame by frame process. The film transport system handles the film by it’s edges and has no sprockets or claws, this virtually eliminates the possibility of film damage. Image capture is triggered by an optical system using the sprocket holes in the film as a reference. The unit also incorporates a cold light source, totally eliminating the possibility of burn through. Even film that has shrunk or has damaged sprocket holes can be captured, this is dependent on the extent of the deterioration. Post capture we use AVID Media Composer to edit and colour correct where necessary. Output files can be supplied in the following popular formats. If you require a specific file type please contact us, we can output many different file types. There are no setup fees or minimum charge. The minute count is summed from all the reels and round up to the nearest minute, then multiplied by the minute rate. For example, 3 x 3.5 minute reels = 10.5 minutes = 11 minute charge. Audio is captured separately and added at the post scanning phase. As a result the audio / video synchronization cannot be guaranteed 100%. Slight variations in the timing of the different machines can cause minor issues. The film scanning system requires leaders of sufficient length to thread the machine. Damaged or short leaders will need replacement. There is an additional charge of $1.50 per 500mm leader. There are no other charges. Film splicing (if required) is included in the price. We stock genuine Kodak Super 8 film. All film types = $ 60 per roll including GST. No refunds or returns on film sales. Click here to go to our Trade Me store – fast easy ordering and secure online payment. We carry stock of the most popular film types, contact us for current stock levels. 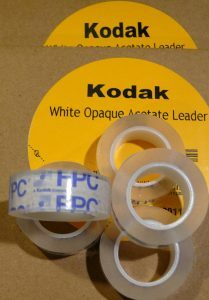 Digital Mix stock genuine Kodak film supplies and can order film from Kodak on your behalf, subject to a minimum order value. Unfortunately film cement is extremely difficult to source and is considered a “dangerous product” by freight companies and airlines. We will continue to try and source film cement.